The Safety QR Code bracelet has just been launched thanks to new collaborations and experiments with innovative materials. It is now possible to use Jacquard looms in order to sew the QR codes, which makes them resistant to washing and maintains perfect readability of the code. Safety QR Codes in this case have been designed for the safety of children as well as the elderly or disabled individuals, who may get lost . At major events, in unknown cities or big crowds, they will have a safety net, whatever the circumstances may be. 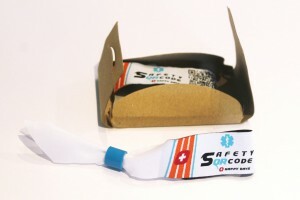 Safety QR Code bracelets, can record a voice message with all the necessary information for those who come to your rescue in case of need.